Trees are an important feature in both urban and rural landscapes, not only are they aesthetically pleasing but they also provide screening and shade as well improving air quality. As more of our open space is developed, the areas around trees become smaller, as the trees and their root systems become larger everyday. Retaining trees in urban and rural developments and existing dwellings can bring problems such as roots systems encroaching on footings and services such as gas, electric and water causing significant damage. Strong tree roots on some species can uplift, driveways or patios and cause extensive damage such cracks in structural walls. Climbatize Ltd however have created a number of systems to deal with root problems without the need for tree removal, prolonging the life of the tree allowing you to enjoy your tree rather than see them as a problem. How do tree roots cause problems? Tree roots absorb nutrients and water from soil as well as serving as a support system for the trunk and canopy. These roots spread as far as possible, mostly horizontally in the upper 60CM of topsoil and can spread up to 3X the height of the canopy. As these roots spread out with the growth of the tree, they look for nutrient packed moist soil. 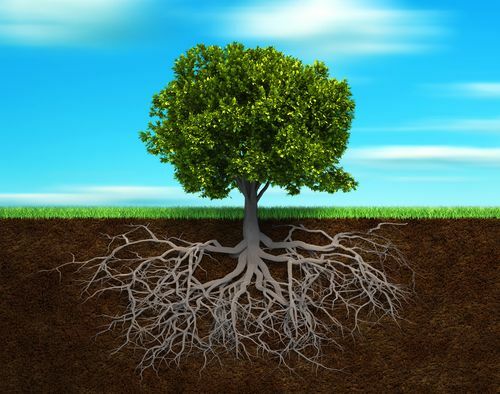 If the tree roots detect an area of poor soil, they can grow at an alarming rate to seek better rooting soil. If an object gets in the way of the trees roots, as they seek nutrients and water they can grow around objects, through gaps, underneath or even over the top in order to find what the tree requires. This is where problems can occur in relation to buildings, services or landscaping. How do developments and landscapes cause problems to trees? Although trees are one the largest natural living organisms on earth their roots system can be one of the most delicate. The severing of roots can severely damage trees, leading to crown dieback and instability of the trees structure. Its is to be noted that, if the tree is protected by the council either under a TPO (tree preservation order) or within a conservation area, the wilful damage or destruction to any part of tree (including roots) is an offence and failure to comply can lead to hefty fines. The storage of construction materials around RA (root area) and spillage of cement, sand or liquids etc can damage tree root soil ph and oxygen levels. Soil compaction from heavy construction traffic or even human traffic is the most common factor involved in compaction and this can lead to little to no oxygen or water within the soil, again this is a bad rooting environment that can lead to crown die back or death of a tree. Why should we keep trees, instead of removing? Trees add amenity value to the landscape and where possible removal should be a last resort. The effects of climate change are now well known, trees help to combat climate change by absorbing CO2 and releasing oxygen. Did you know that in one year an acre of mature trees absorb the same amount of CO2 produced by driving a car 26,000 miles! Not only do they clean the air they lower temperatures due to the vast shade they create and also absorb noise pollution. Because of this, trees should be retained as much as possible particularly in the urban environment. Can you imagine a whole town or city without trees? If development continues within all of our open spaces this could be something we are looking at in the future. The services we have to offer mean that trees can thrive and stay healthy around buildings. Damage is limited to a minimum, to both the trees and surrounding developments. This means that the trees can live longer and keep helping to clean the air that we breathe. What tree root services do we offer? When construction or landscaping is be carried out around trees, an RPA (root protection area) should be set out by a qualified arborist to protect the trees rooting area from ground compaction and soil disturbance. After all prevention is better than cure. Our qualified arborists can determine exact root RPA’s and then construct suitable measures for each site, such as fencing and ground track matts. 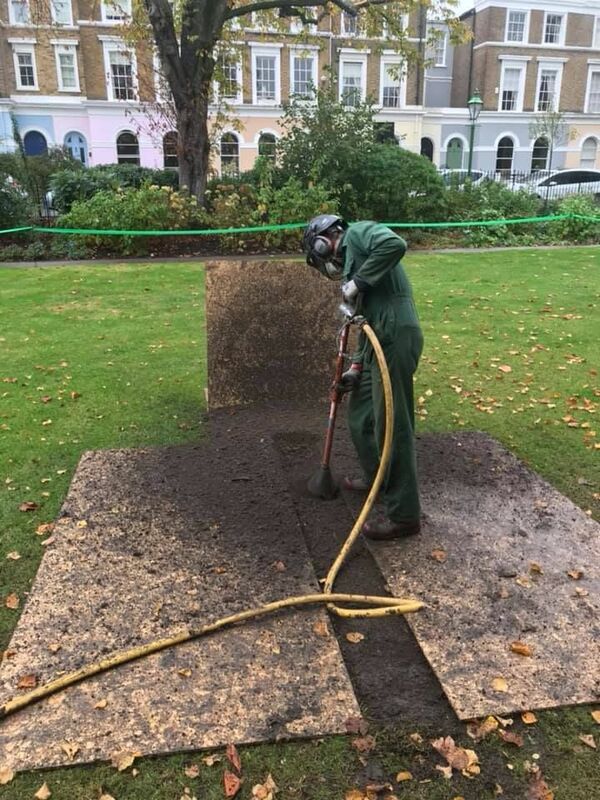 If trees roots are suspected to grow or are already growing towards a building or landscaping, a root blocker system made of a geosynthetic material GRBS can be installed to ensure that roots do not pass the membrane and/or create further damage. This can be installed with minimum ground disturbance using a no dig or dig solution depending upon the roots current location. The ground is then reinstated with minimal disturbance. When its suspected that the soil around a tree is not nutrient rich or has been compacted and a trees health is in decline, a system called radial trenching and mulching RTMS is used. Trenches are excavated around the entire circumference of the RA (root area) using a no dig solution (high powered specialised air tools), which do not harm the root system, these trenches concentrate on the upper soil levels where root activity takes place, these trenches are then backfilled with a suitable nutrient dense mulch to encourage new and further root growth and to ensure much needed nutrients, water and gaseous exchange can take place. A Geosythetic cellular confinement system is used on top of existing soil levels as a no dig solution, to create a root protection system. These confinement systems spread the weight across the soil alleviating soil compaction, a clean angular stone is infilled in the system to allow for water and gaseous exchange of the soil. These systems can be used to create temporary or permanent work areas, access roads, car parks or landscaped areas around a trees RPA. The root protection system can then be left unpaved or can be paved on top of the geo grids. The system complies with BS5837:2012, APN 12 and tree preservation order (TPO) guidelines. assessed, a number of different systems could be used to combat any root problems or the tree can be left undisturbed to keep growing.